Patricia Morris: "Trans-Canada Drive paintings"
"A gesture creates a line, line creates space and shape," says Partica Morris in her artist's statement. "The intention behind the gesture is reflected in the line giving it identity, and introducing drama to the space. If the gesture(s) is directed by emotion, and all elements remain abstract, any interpretation if meaning must be intuitive in nature. The abstract paintings are explorations of this very simple occurrence. With each and every painting I hope to convey an insight, to awaken associations, or to nurture positive energy of the sort that makes life meaningful." Glimpses of our Canadian landscape as seen from a moving vehicle. The images are sometimes site-specific, sometimes generically Canadian and always blurred by the speed of passing or glancing. An abstracted relationship with landscape is rendered as a fleeting impression rather than as a physical space. Glimpses of familiar moments, images that inspire contemplation of time, space, place and our relationship to the great Canadian landscape. You are aware of the passing landscape and of being removed from it with your seatbelt fastened. You are moving fast and you are sitting still, experiencing the transient image as it flies by. Light and colour dazzle your eyes as your mind wanders, passing time until your arrival. Morris’s paintings tell us something critically important about our relationship to the land, and our experience of this particular moment in time. They speak of movement, transience, change, the way we experience things more and more through technology or “media” rather than actually being there." Born on Jan 1956 in Beauharnois, QC, Patricia spent her childhood in Kitmat, BC, and her teenage years in Newcastle upon Tyne, England, where she completed her "O Levels" and an early "A Level" in Fine Art. 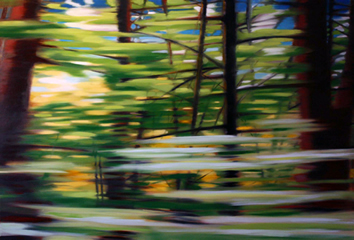 In 1979 Patricia completed her BFA with honours at Mount Allison University specializing in sculpture and drawing. She taught drawing and sculpture in Mount Allison University's Fine Arts and Continuing Education Departments in the early '80's, and completed her MFA at Concordia Univiversity in 1983. 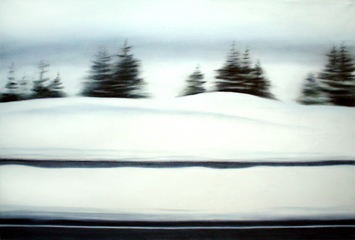 After completing her diploma in Art Education at McGill in 1989, she moved to Kingston Ontario whereshe taught Fine Arts at the High School level as well as continuing to exhibit her own works in solo and group exhibitions in Kingston, Ottawa, Toronto and Montreal. In addition to her career as a professional artist, she is also involved on a volunteer level with local charitable organizations, and is president of West Island Association for the Intellectually Handicapped, Pointe Claire, Que. 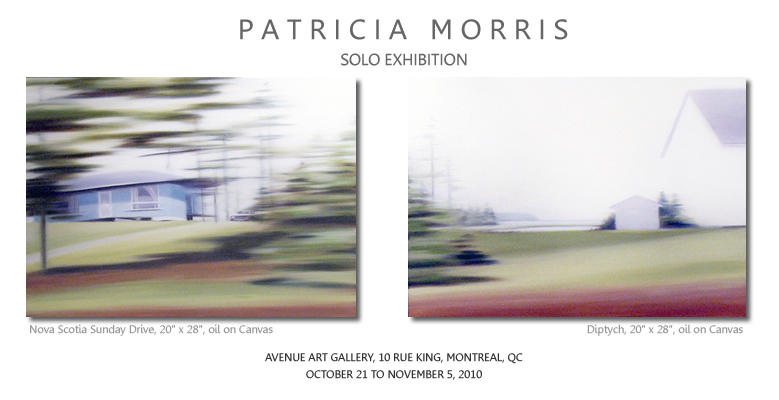 Patricia Morris' the Solo Exhibition Trans Canada Drive will start on October 21 and will continue until November 5, 2010. The exhibition is at Avenue Art Gallery, located in Multi Media City in Old Montreal. (10 rue King St. Montreal, QC, H3C 2N9, Phone:514 867-3745 or 514 489-4888).